There’s not much worse than having sewage back up into your house. 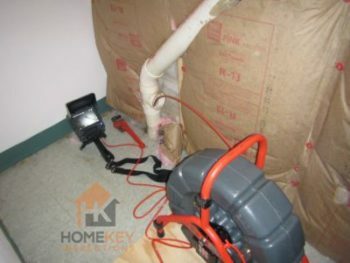 HomeKey’s Sewer Scope Inspection can save thousands in damage and repair costs. Think a new roof is expensive? Think again. Depending on the complexity, the cost to replace a sewer lateral pipe can reach upwards of $40K+. Our Sewer Scope inspection can protect you from purchasing a failed or failing sewer lateral pipe. We put a professional camera that records video through the sewer lateral pipe to inspect the condition of the pipe at the time of your inspection. The inspector will access the pipe through a clean-out in the house or yard, or possibly from a roof plumbing vent (we do not remove toilets). Not sure what a Sewer Lateral pipe is? The sewer lateral pipe is the large pipe that connects a property’s drainage system to the public sewer or private septic system. It is responsible for removing the waste from your home in a safe, sanitary way. Properties with cast iron sewer lateral pipes are strongly recommended to have a sewer scope performed as the pipe is likely at the end of its life. Cast iron sewer pipe has a life expectancy of about 65 years and most homes with a cast iron sewer lateral pipe are approaching, at, or past 65 years old. Poor installation (even with new construction) causing flow issues. Bellies in the pipe from settlement or heavy equipment driving over the pipe, causing water to not flow and potential for soft blockages. Root intrusion from breaks in the pipe or poorly adhered joints. Channeling in the pipe: A condition where the bottom of the pipe has deteriorated is leaking into the soil, common with old metal lines such as cast iron. Not only is the sewer water leaking into the soil which is a health hazard, but the sharp edges of the deteriorated pipe often cause snags and soft blockages. Heavy scale build up – The inside of the pipe can narrow over time due to heavy scale build up (sediment) on the surface. The calcification creates a lining on the inside of the pipe that can cause flow issues over time, as well as soft blockages. In extreme cases, the scale build up can get so bad that there’s only a pinhole opening. Descaling is possible but expensive (ranging in the $2K-$4K depending on severity). Offset or damaged seems and joints in the pipe. Offset seams can cause water flow issues, root intrusion or the pipe to leak. 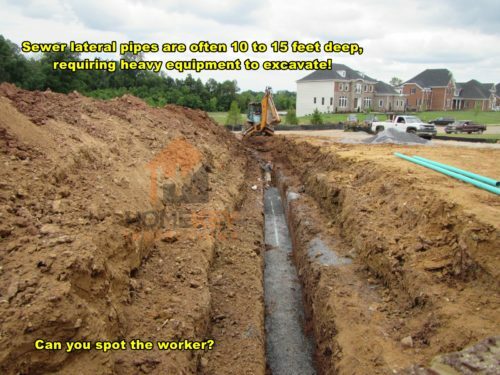 Crushed or collapsed pipe due to heavy equipment or inadequate backfill. Orangeburg pipe which is a known defective material. For septic systems, a pipe that is full of water before the camera reaches the septic tank can indicate a problem with the septic system. Our Sewer Scope video inspection is considered a preliminary inspection intended to flag concerns which need to be further evaluated by a qualified plumbing contractor to determine severity and action needed from findings.